Corporal Agarn's squad has drawn sentry duty at Potomac Creek Bridge. He placed his guards at each end of the bridge and in the valley below. During his rounds he found Private McGuirk goofing off. Applying some on the spot discipline, he has McGuirk's attention. All the fuss attracts Brigadier General Haupt and his distinguished visitor, G. Stevenson. Haupt makes sure that this is a day McGuirk won't forget. Back at his post, Pvt McGuirk paces up and down the bridge. "Things sure would be easier if they added some dang planks to this blame bridge, " he muttered as he gingerly trod across the open bridge beams. Our chastised private was so focused on not falling off that he failed to notice the locomotive and train drifting slowing across the span. Startled, he nearly lost his balance. "I dint make it off Mayre's Heights just to die on this cussed pile o' sticks," he muttered as the train lumbered by. 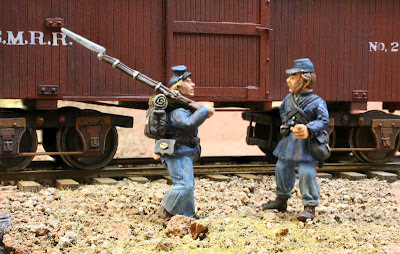 These photos illustrate one of the advantages of modeling the ACW RRs in O Scale. The figures can be much more realistic than in the smaller scales. General Haupt and Private McGuirk are Sash and Saber Figures. Corporal Agarn is a 40mm figure from a manufacturer that I can no longer remember. It is very well sculpted. I bought it many years ago. As I remember, it was the only figure they offered in 40mm. G. Stevenson was painted by Dave Emery. Bonus, see if you can spot the thing that is out of place or could be considered an anomaly in these photos. Hint: It's not the W&A Locomotive General running on the USMRR. Hint 2: It's in the first two pictures. Here are some step by step photos showing how I made the piers and installed the bridge at Potomac Creek. I made the base layer for the piers from laser cut 1/8th inch plywood. This kept the taper constant and ensured that both piers are the same size. I covered the piers with embossed sheet plastic. 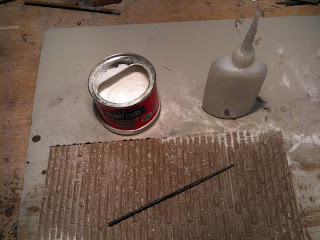 To fill in the seams I used CAA glue and baking soda. 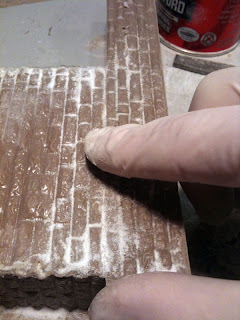 The baking soda makes a slightly gritty texture when it cures that works well with the stone surface. I used Zip Kicker to accelerate the glue set. The wood beams on the top of the pier are necessary because the truss is wider than the piers. 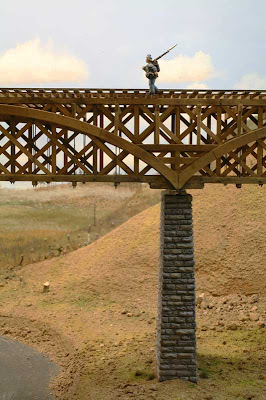 Since the USMRR built the truss around the existing trestle bridge, it ended up wider than the original truss. Thus they needed these wood beams to support the new wider truss on the original piers. 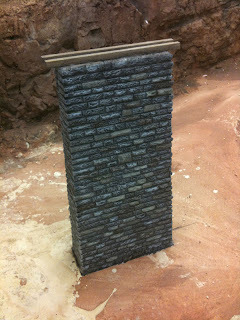 To blend the terrain around the abutments with the precast rocks below them, I hand carved Durhams Water Putty. Once it was cured, I painted the rocks with the base scenery colors to blend everything together and then added some basic texture with ground foam and static grass. Gosh, sometimes realizing a simple thing hits you like a sledgehammer. 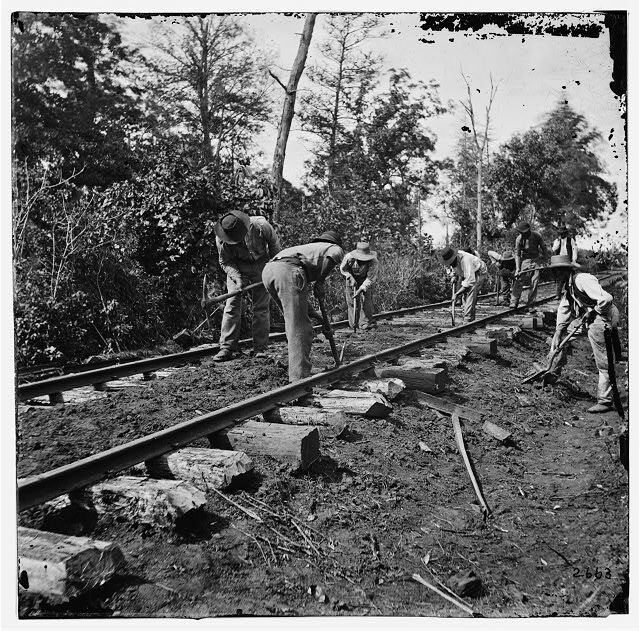 I recently ran out of spikes while laying the track from Potomac Creek to Brooke. In the past I could saunter over to the local hobby shop and pick up a pack or two. Since there are no longer any hobby shops in the Northern Virgina area, picking up mundane supplies like spikes and bottles of glue have become an exercise in logistics planning. So I decided to order a batch of spikes to see me through the end of the project. I calculated that I need about 24-28 spikes per foot of track. With about 300 linear feet of total track to go and allowing for a 25 percent waste factor, I needed 10,000 more spikes to finish the project! Wow, that was a revelation. I just hope my elbow can hold up driving all those spikes. Speaking of spikes, finding model railroad spikes with near scale size heads has become a lot tougher, not just locally, but nationwide. I have heard the tool that the vendor Micro Engineering uses to make the spikes wore out or that the vendor went out of business. The replacement vendor is using a different die that does not cut the head as small as the previous spikes. The low profile spikes that Micro Engineering currently offers have a blunt end that punches and crushes the wood of the tie and does not allow for a secure hold without pre-dilling. After consulting with other hand laid track modelers, I ordered a batch of 10,000 small spikes from Micro Mark. I hope these are closer to scale size than the spikes I have been using. The bridge at Potomac Creek is finally done. I got it installed and tested over the snowy weekend. 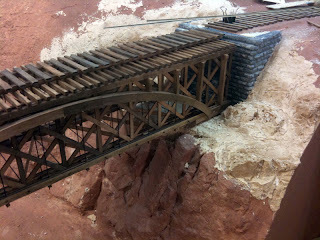 The scenery is not complete, but the bridge construction is. Here is a short video showing the first runs across it. Although I made good progress on the bridge, I did encounter a problem with the roadbed just to the east of the bridge. The roadbed warped laterally and was causing derailments. I could not get it level, so I had to rip out a section and must do it over. You can see the construction in the last clip in the video in the distance. Oh well, two steps forward, one step back. The record snow that Northern Virginia is experiencing right now gave me pause to think about the winter of 1863. According to the company clerk of the 13th Mississippi Regiment, there were 14 days of significant snow fall in the first three months of 1863 while in winter quarters with Lee's army. 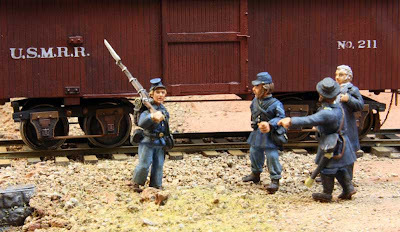 Northern soldiers were used to snow, but to the many of the southerners it was an exciting experience. Their exuberance lead to perhaps the biggest snowball fight ever when on January 31, 1863, Gen William Woffrod marched his Georgia brigade two miles with haversacks full of snowballs to "attack" Kershaw's South Carolina brigade. Of course it got out of hand with 4,000 soldiers engaged at ranges less than 100 feet. Boys will be boys. After the Burnside mud march, both armies set up winter quarters. They built elaborate camps, including huts with fireplaces, wooden beds and numerous other "fine articles to tedious to mention" according to confederate Private Torrance. Military activity was primarily confined to picket duty. 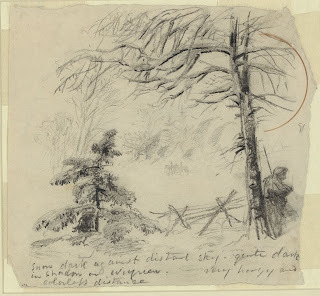 Alfred Waud captured the cold, lonely detail in his sketch of a solitary sentry seeking shelter under a tree. Units rotated picket duty. Normally a whole company would leave camp to spend a few days spread across the front lines at frosty picket posts. Many times soldiers from opposite sides fraternized, often trading tobacco for coffee or other luxuries, but for the most part it was a cold, wet and boring task. So think about these soldiers while you are shoveling this weekend. 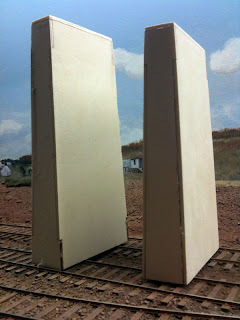 No progress on the layout these past few days as I have been working on some other projects. But I did receive a nice note from Private S. Hainstock, of the 7th Michigan Infantry Regiment USV, Company B, a reenactor unit. He alerted me to a living history presentation that takes place near Falmouth, VA where his unit participated. The 7th Michigan Infantry reenactors helped unveil a historic marker at the Union Church where they had war-time winter quarters. 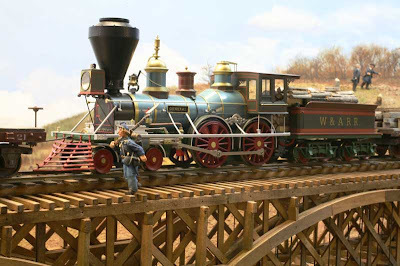 Several of the 7th are also model railroaders. The APVA Web site has the following description of Union Church. The Falmouth Union Church was built in the 1820s on the foundation of an earlier church, which burned. As a "union church" it was used by Baptists, Methodists, Presbyterians, and Episcopalians on a rotating basis. It remained a focal point in the Falmouth community until storm damage occurred in the 1950s. Most of the structure was then torn down to salvage old bricks. The Union Church is just a façade today, although a contributing structure to the Falmouth Historic District. There are no mandatory guidelines or landowner restrictions, however, governing the historic district. The church, an unfortunate victim, suffers from a number of structural maladies. Ruins of the belfry and cornice continue to rot or remain open to the elements. It is feared that the 2,000-pound bell -– still in its belfry! –- will fall and cause considerable damage. What exists of the east wall is precarious, especially at the base. Currently, iron rods are barely holding the structure together. Deteriorated asphalt shingles are lost with every strong gust of wind. Although in disuse, Union Church continues to serve as a focal point, giving cultural identity to the historic town of Falmouth. It is a visual statement of the Town’s past and a reminder of the much-needed role of preservation in the community. The Church deserves salvation as a fine example of Federal architecture in a religious structure and as a survivor of war, storms, and salvage assaults. The Union Church was about mile from the railroad and probably not visible from the tracks. But it is tempting to include it on the layout some place.